Mwah-ah-ah-ah-ahhhhh!!! My master plan is complete! I now have three pie dips to serve at a party for the ultimate dessert bar experience!! Note to self: Schedule party so you can create the ultimate dessert bar experience. HOW COOL would it be to serve this Peanut Butter Cream Pie Dip, the Key Lime Pie Dip and the Coconut Cream Pie Dip together with an assortment of graham crackers, shortbread cookies and chocolate wafers or chocolate graham crackers?! Combine sweetened condensed milk and cream cheese and beat with an electric mixer on medium speed until smooth. Add peanut butter and powdered sugar and mix until blended. Add half of cool whip and mix until smooth. Fold in remaining cool whip and mix until just combined. Add mixture to a serving bowl and refrigerate for four hours. Garnish with chocolate graham cracker crumbs if desired. 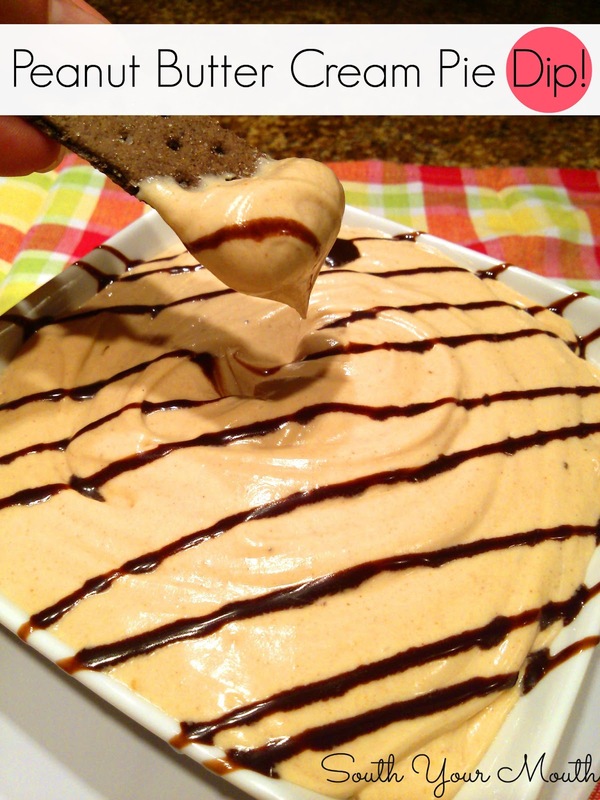 Serve with or chocolate graham crackers or chocolate wafers for dipping. Feel free to use this as a pie filling too. It should easily fill two standard chocolate pie shells. I am SO making this this weekend when my daughter and family come for a visit. I just bought some chocolate graham crackers too....I will be taste testing this dish in my dreams. =) Thanks so much for sharing another special recipe at Weekend Potluck. I love your blogs and your recipes. I live in Illinois but swear I have the heart of a southern girl. Thanks for sharing.